Motorola Mobility announced revenues of $3.3 billion in the third quarter on sales of 4.8 million smartphones and just 100,000 Xoom tablets that resulted in an operating loss of $32 million. The company's Mobile Devices group contributed $2.4 billion toward overall revenues, shipping 11.6 million mobile devices, 4.8 million of which were Android smartphones. But that group itself lost $41 million in the quarter. Compared to its year ago quarter, Motorola's Mobile Devices group sold 2.5 million more phones (up from 9.1 million total) but only 1 million additional smartphones (up from 3.8 million). Over the last three quarters of 2011, Mobile Devices has lost $215 million. Earlier in the year, Motorola had shipped 250,000 Xoom tablets in the first quarter and then 400,000 in the second quarter, making this quarter's trickle of 100,000 evidence that the Android 3.0 Honeycomb flagship has sunk. 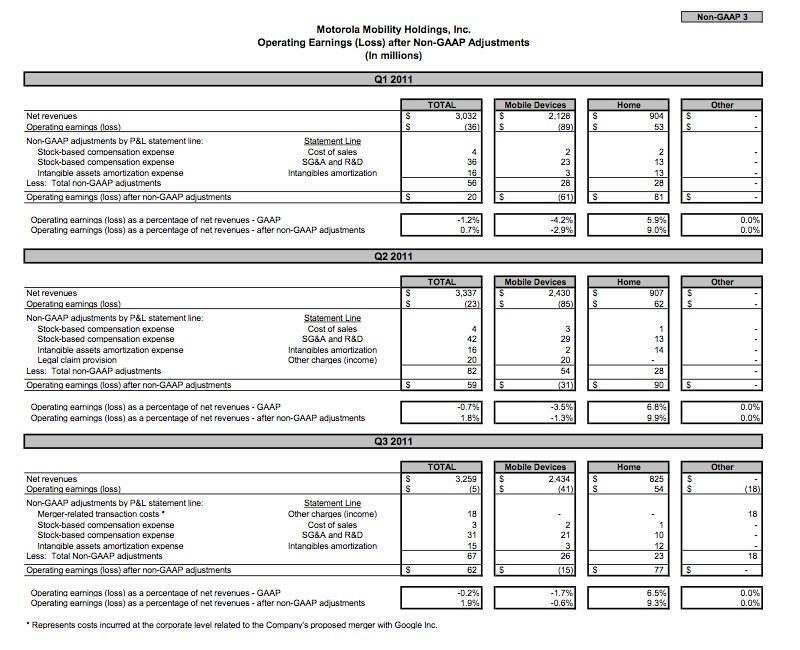 Motorola's Home segment, which builds set top boxes and video equipment, brought in just $825 million but its earnings contributed $54 million. Google announced plans in August to acquire Motorola Mobility, ostensibly to use its patents to "protect" Android from intellectual property infringement cases. However, Motorola's stated objectives indicate that Google was really trying to prevent Motorola from suing other Android licensees itself. Motorola had also threatened to build its own mobile OS or join Microsoft in making Windows Phone 7 devices. Motorola stated that its acquisition by Google "is expected to close by the end of 2011 or early 2012," and that the company "will hold a special meeting of stockholders on Nov. 17, 2011, to seek stockholder approval of the proposed merger with Google." Sprint says iPhone most network-efficient smartphone and "worth every penny"